Goodreads: Melanie is only going through the motions of living since refusing Jack’s marriage proposal. She misses him desperately, but her broken heart is the least of her problems. Despite an insistence that she can raise their child alone, Melanie is completely unprepared for motherhood, and she struggles to complete renovations on her house on Tradd Street before the baby arrives. When Melanie is roused one night by the sound of a ghostly infant crying, she chooses to ignore it. She simply does not have the energy to deal with one more crisis. That is, until the remains of a newborn buried in an old christening gown are found hidden in the foundation of her house. Kritters Thoughts: As the title of this installment suggests, this book is a return to Melanie and her story. 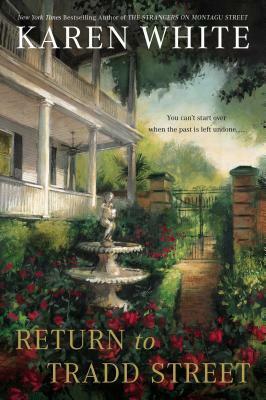 This book centers around the house she lives in and although she may have taken care of a ghost or two in her home, there are more than perk up and need her help. This is repeating myself, but let me say again, start this series at the first book and if you take some time in between each book, the first few chapters help you remember the high points and get you back on track in this series. As I am a fan of the main character Melanie, maybe because I see a lot of myself in her, I liked that this book centered around her and the home she has come to know and love. I loved that although she had helped some ghosts there were still more that were tied to this home that needed her. It was interesting to read more about Nevin's former generations and how there are more than one secret in each family! Tomorrow is a review for the latest that just released, I enjoyed getting to read this series back to back and start my new year with this series. Disclosure of Material Connection: I received one copy of this book free of charge from Berkley. I was not required to write a positive review in exchange for receipt of the book; rather, the opinions expressed in this review are my own.